Ok, now that we've had a few roosters in our flock, I think I'm at least semi- qualified to explain this phenomenon, which gives roosters such a bad reputation. 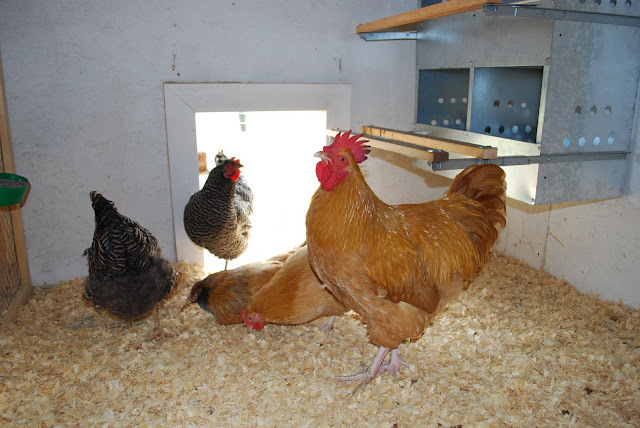 I'm sure many of my readers can relate-- if not recently in their lives, then perhaps earlier in their childhood they can remember some rooster stories to make us all laugh. Of course, at the time, I'm sure it was no laughing matter! Our buff orpington rooster, Foghorn, in his younger days. RIP. Roosters seem more than happy to perpetuate the myths of their terror-stalking ways. One thing I've learned is that they ARE territorial. And if you don't remind them who is the boss, they will happily take that role over for you and be the boss of everything around them, including YOU. That was the mistake I made. I let our roosters strike fear into me, and I avoided them. Here's the best explanation I found on the internet and I hope it helps others realize the best way to make your rooster see things YOUR way. Go ahead, click on over and read this. It's very interesting, full of good information, and it's a short read too. What more could you want? So what do you think after reading the above page? Is this new information for you, or did you already know this? It makes good sense, doesn't it? I already knew that it's a good thing to handle chicks (and guinea keets) as much as possible the first 2 weeks after hatching, if you want them to be tame. In our case, this is extremely difficult - we both work and we're gone enough that it's hard to be consistent in this endeavor. 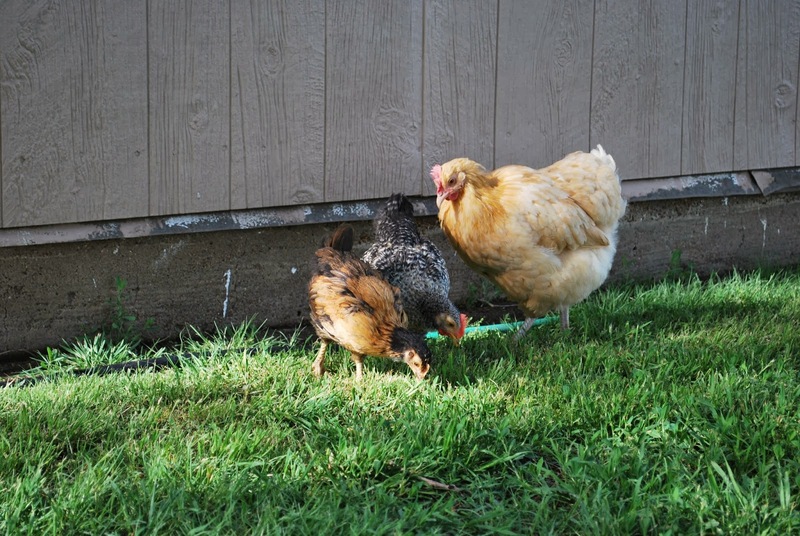 In addition to our time crunch, our buff orpington Sally was diligent in watching over her chicks 6 months ago. She made absolutely sure that we did NOT touch them in any way! Roo-boy, crowing his supremacy... um, no. We'll be taking back our living area starting TODAY. So I don't blame our rooster - he's just being a rooster, after all. He wants to be King of the flock and everything else around him. It's in his DNA. He can't help it. We'll commute his death sentence for now, and give him another week or two of grace, and see if he accepts our alpha-ness. He's young; he still has the potential to learn a new game. I hope he's smart and decides to play along, and play nice. After all, he IS a pretty boy. It's hard to see in the photos, but he's beginning to grow some green feathers in his tail -- gorgeous! If he doesn't want to be nice, well, there's always chicken and noodles. A 7-month old rooster would do nicely. I'm halfway through my Whole30.... WOOHOO!! I've done pretty good overall. My toughest moment came last night when the hubby was drinking a few adult beverages, while I sipped my fruit-infused water. ARGHHHHH!!!! I wanted a glass of wine SO.BAD. But I held out, hard as it was. And I woke up happy this morning, that I didn't kill the last 2 weeks of progress. Today I needed to make more mayonnaise, so that I could make some creamy Italian dressing for my salads. I love homemade mayo -- so creamy and with a slight lemony taste! While my Chocolate Chili simmered, I made my mayo. Let me just say this -- after making mayonnaise twice now, I'm thinking a food processor might be the better appliance to make mayonnaise. The key to fluffy homemade mayo is 1) having your ingredients at ROOM TEMPERATURE and 2) streaming the extra light-tasting olive oil as thinly as you can. And do be sure to use cheap, light tasting olive oil. If you use extra virgin olive oil you will most likely be sorry - it will taste strongly of olives!! It takes anywhere from 2 to 3 minutes to stream a cup of olive oil. While I'm streaming my extra light-tasting olive oil into the blender through the top removable cap, I get a lot of spatter even at the lowest "stir" speed. So I try to barely crack the top cap open, letting the oil hit the edge of the rubber lid where it rolls down into the glass blender. And it would appear that others have the same spatter issue (read some of the comments on Melissa's mayo blog post). This might give you an idea of the mess involved?! All that being said, the next time I make my mayo, I'm going to try using my immersion blender. It appears that it's way easier to make mayonnaise this way, unbeknownst to me. So here's the link for you, my dear reader, that I just found. You will also get a very brief chemistry lesson if you click through to that link - very interesting to read! Luckily, my second mayo creation turned out as well as the first time. Fluffy, light and yummy, the way it's supposed to be. It's really not this yellow in person. Really, it's not. What's really cool and neato is that the mayo recipe makes enough to fill a jam size canning jar, and then if I dig the rest of the mayo out of the very bottom of the blender, and up the sides of the blender, I get 1/4 cup more, which just happens to be the amount I need to make my creamy Italian dressing! I know, pretty cool, huh?! I used red wine vinegar for my dressing - you could use balsamic or white wine too. It's easy to make your own mayonnaise, really it is. And so much healthier for you. And just think of the modifications you might try.... I think I might add a little cumin to my next batch! And I would also like to try a batch of aioli, which would be the mayo with garlic and basil added. With my next mayo batch, I want to try this salad dressing recipe: Southwestern Cumin Lime Dressing. Doesn't that sound super delicious yummy?! Only 15 more days to go with my Whole30! Lucy and Molly, 6 months old now! It hasn't been easy, but in fact, I've been helpfully motivated by some lovely naysayers at work. Mind you, I didn't exactly tell anyone what I was doing. I just made an off-handed comment that I was trying to eat healthier, I had eliminated wheat and sugar from my diet for 30 days, and it's really hard to eat the right foods on a daily basis. That's all I said. And one co-worker said, quite snottily and with a hearty "I know everything" attitude, "You can't do it." Another person said "you can't undo all the damage of eating wrong for years, you'll still have health issues". Yep, just light, airhead conversation with any of my oh-so-wise and knowledgeable co-workers from now on. So with that out of the way, if you're wondering what I've been eating (and drinking) the last few days, here's an update. I've had a bit of salad - baby spinach and a red/green romaine mix with Walden Farms Creamy Italian dressing. Walden Farms' dressings were the closest to Whole30 compliant, as far as no soy, no grain/gluten, etc. The label says "sugar-free" BUT at the end of the ingredients it lists sucralose. Ahem, someone needs to tell Walden Farms that IS sugar. However, being it's at the end of the ingredient list, that means there's a minimal amount. Bottom line - not thrilled with the taste, so I'm going to make my own mayo today and from there make some of the dressings in the "Well Fed" cookbook. From Melissa Joulwan's "Well Fed" cookbook. This stuff is awesome. You need to try it. Really. Click the link, get the recipe. Here's a pic of mine, topped with some thinly sliced avocado. 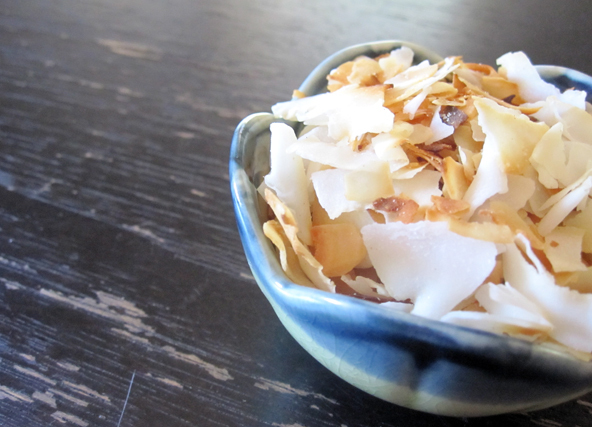 I also made Caramelized Coconut Chips, again from the "Well Fed" cookbook. Very easy, only 3 ingredients, and quite yummy as a snack. You can get coconut flakes from Amazon (see links on recipe link page) or your local health food store likely has them. That's where I got my bag. I've had fresh, pastured eggs for breakfast and some sausage patties, also from a pastured hog. We bought half a hog back in March from the same farm where I get raw milk. So we know what "our" hog ate. Heather at Faye Farms keeps her animals on as natural a diet as possible. I've been eating fresh bananas, apples, strawberries and grapes. I also made some applesauce the other day, fresh homemade WITHOUT any sugar. Water, a bit of cinnamon, a pinch of nutmeg, and a smidge of vanilla. That's it, and it's freaking good. What have I been drinking, you may wonder... especially since those who know me, know that I really don't like water. (Luckily, I've never been a soda drinker so I don't have to deal with those cravings!) I usually flavor my water with Propel Kiwi Strawberry packets, and we just know those probably have a ton of sugar in them! When I Google'd "ways to flavor water", I found this awesome link with so many great ideas. On Tuesday, I chopped up a cucumber and picked some mint leaves to make a very refreshing water beverage. Today my water pitcher holds sliced oranges and lemons for a citrus-y twist. Yum! I started out drinking my coffee black on Monday. It was tolerable. But I really do love my half and half so I Google'd that also.... how to have creamer on a Paleo diet??? And I found this gem of a link, which uses coconut milk, coconut oil, and an egg. IT WORKS. I really like it. It's not a so-so substitution, it's a delish substitute! As you can see in my photo, it's rather frothy, but it's good! And it will last in my fridge for a few days -- I simply popped it into the microwave for a few seconds to thin it a bit before adding to my coffee today. I did notice some physical symptoms on Monday and Tuesday -- nagging headache, overall fatigue. I'm attributing this to my body wanting sugar and not getting what it wanted! The book "It Starts With Food" tells you what to expect during each week of your Whole30; we are warned that days 1 to 7 will most likely not be pretty. The most common withdrawal symptoms experienced by Whole30 participants are headache, lethargy and crankiness - commonly called the "carb flu". Your body is adjusting to a new fuel source and we're advised to give it time to recalibrate. Freshly cut pastures make a great walking/running course! So that's a summary of my Whole30 life the last few days. This morning, I pinned a whole new slew of motivational quotes to my "Philosophies to Live By" Pinterest board. I'm very motivated to stick with this! I won't lie, it has NOT been easy. It is a huge challenge. On both Monday and Tuesday I felt like I was going to start hyperventilating as I walked around the kitchen, opened the fridge, opened cupboards..... what CAN I eat??!! I didn't plan my start date as well as I should! My Tuesday trip north to Wichita to Green Acres market fixed that, so I'm doing much better now. Anyone else out there trying to do the Whole30, or something similar? I would love to hear about your challenges, and any tips and tricks you might have discovered to help you stick with it. Since a few others have also expressed interest in this, I think it would be super duper if we could all motivate and encourage each other to stick with the Whole30.... for the whole 30 days, of course. The most important thing for you to know is that this is FREE. It doesn't cost anything but your time to read what the Whole30 is, and then make the commitment to do it. ... we can share ideas, share recipes and photos, share what we're doing that day, resourceful web links, or just simply encourage each other not to give up. "It’s only thirty days, and it’s for the most important health cause on earth – the only physical body you will ever have in this lifetime." But do remember, this is really more than just 30 days. After the 30 days are up, we can share what we've accomplished, and then continue to help each other stay healthy by eating healthy. It's far too easy to slip back into old habits, and after making such a monstrous effort to change those habits, we don't want to even think about eating doughnuts or pizza or, or, or... ice cream again! Ok, maybe once in a blue moon a little bit of ice cream wouldn't hurt. The good news is that once you've abstained from the wheat- and sugar-containing foods, your desire for them diminishes immensely. If you'd like to join our group, please leave us a comment here - let us all know what you hope to accomplish. Then head on over to our group Facebook page and join up with the community, not just to motivate and encourage yourself and everyone else, but to feel like you're part of something bigger. I think we will enjoy this journey all the more since we won't be doing it alone! The basics of the program - what you need to know. There are also links on this web page for a shopping list and a meal planning template. Print the in-season vegetable/fruit guide here. For $14.95, you'll get a new email every.single.day, to encourage you to stay on-track. There are tons of paleo and primal books out there. These are 4 of my favorites. Find these information-packed and motivational books on Amazon, or at your local library. nomnomPaleo.com See her Whole30 Rundown for more recipes. Mark's Daily Apple I signed up for his weekly email -- once a week, that's all. Plus your free bonuses. The Clothes Make the Girl That's her cookbook, Well Fed, listed above. This recipe is definitely in my Whole30 plan - sounds delish and I can't wait to try it out. The ingredients on Frank's Red Hot Sauce look perfectly acceptable for paleo, so I won't need to buy the expensive Tessemae's wing sauce - however, I may try one or two of their salad dressings. So what are you waiting for?! Join me! Disclaimer: Most of the web links within this blog post do not provide any financial gain for me - these are simply my favorite resources and I'm sharing them with you. Only the 4 Amazon books listed may provide a small commission for me if you decide to buy them through my links.